... to Triathlete Within, multisport coaching and training services of Jill Kirker & Chris Lough, based out of Canmore, Alberta. 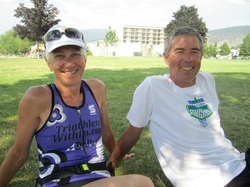 Both Jill and Chris have trained for and competed in all the major triathlon distances since 1990 and have brought that experience to their personalized coaching service. They hold National Coaching Certifications (NCCP) in Introduction to Triathlon - Competition. Mission … helping individuals gain health benefits and confidence through participation in multi-sports programs. As triathlon coaches our aim is to provide support and direction to all levels of athletes; people that are new to the exciting and rewarding sport of triathlon as well as experienced triathletes who are looking to further their fitness goals.